In a crisis I become a sponge for knowledge. I love to find solutions for problems; to discover what has worked for others and see if it will work for me too. These days when I connect with recently separated people, what they most want to know is that this pain won’t last for ever and how to make it better. I was the same when my marriage ended; I was emotionally distraught and wanted so desperately to know that it was all going to be ok. My mission became to absorb as much learning as I could about how to heal from emotional pain and how to use the past to become happier and stronger in the future. I then went on to write this blog and eventually my own “how to” divorce book, to share the processes and methods which led to turning my divorce into the best thing that could have happened for me. 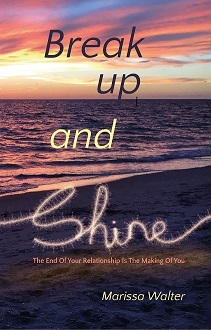 In Break Up and Shine, I draw on what I learned in those early days and, if you have read it, you may remember I refer to several key books which helped me. These are what I want to share with you today! This powerful book taught me to see change in a completely different way – it was an “aha” moment where I began to see the reality of divorce as a new beginning instead of simply a loss. In this book Gabby Bernstein shares her journey of turning a life crisis into a mission of self-empowerment through trusting in her own soul and the guidance available to all of us through practising faith and positivity. This book is all about self-love, realising your own self worth and allowing your self-compassion to heal you from the inside out. It teaches you that you are in control of your own life. At the end of a relationship one of the things we want to know most is that we are still able to find love and that a bad relationship hasn’t ruined things for ever for us. 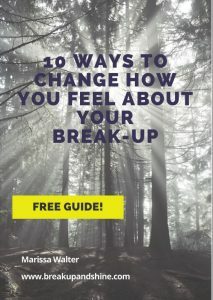 Using this book helped me to clear the emotional and mental blocks, ensuring that I was ready to allow new and healthy love into my life again. Those not familiar with the work of Abraham Hicks may find the concept of the Law of Attraction and energetic vibration a little woo! However, it provides an amazing way of dealing with our emotions from a broader perspective than simply mental. It can shift you into a whole new way of looking at situations in your life. None of these books are specifically written about break-up or divorce, but using their concepts helped me to shift my life dramatically from one of pain, regret and helplessness to empowerment, happiness and purpose. In my own book I tied these ideas together to deal with the specifically with healing and moving forward at the end of a relationship. I hope the list is useful! Feel free to share with anyone in a place of feeling stuck and needing inspiration to move forward from a place of pain.